Jackson was born in Keesville, New York and right after his high school graduation began his career as a photographer and painter. Jackson is best known as the dean of American landscape photographers. In 1886, he went west traveling through Nebraska on his way to California. On his return trip in 1867 he decided to set up a studio in Omaha. Soon after in 1870, he joined the Hayden survey team and worked as their official photographer. While traveling through Wyoming he kept a sketch book and produced the first photographs of the area around Yellowstone. Jackson returned every year, producing a body of memorable landscape images that helped in getting the location designated a national park. Jackson finally retired in 1924, but in the 1930’s he was selected by congress to paint scenes of his trips west. 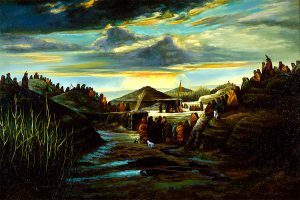 Most of Jackson’s paintings were based on earlier sketches and photographs created during his travels in Nebraska from 1866 to 1871. Jackson took a photograph of a Pawnee village which was located on Beaver Creek near Genoa, Nebraska in 1871. The painting (right) of the same scene was probably done in 1932.